20 civilians killed in week-long regime airstrikes on Damascus neighborhood of Yarmouk. 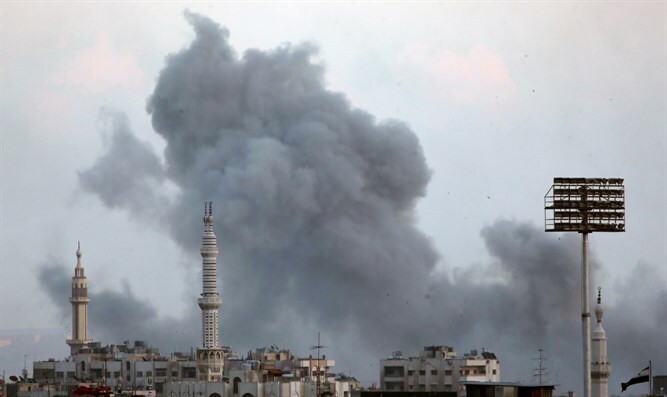 Around 20 civilians have been killed in week-long regime airstrikes on Yarmouk, a neighborhood of Damascus referred to as a "Palestinian refugee camp", the Turkish Anadolu news agency reported on Tuesday. Several people were injured in the attacks, local sources told the news agency on condition of anonymity due to security concerns. According to the sources, regime forces were trying to advance from the southern side of the camp, which accommodates some 2,500 families, amid heavy bombardment. The attacks come after the regime and the Islamic State (ISIS) group failed to reach a deal on evacuating the group’s jihadists from Yarmouk and its vicinity. In 2016, ISIS seized most of the neighborhood from Al-Qaeda, which had been controlling it until that time. The Yarmouk "refugee camp" is in fact a sprawling neighborhood at the southern edge of Damascus. Most of the Palestinian Arabs who live there are descendants of Arab refugees from Israel's War of Independence, though few are themselves refugees. There are thousands of people registered as Palestinian refugees in Israel’s neighboring countries, including Lebanon and Syria. Palestinian refugees in Lebanon have limited work options and are refused citizenship.